The land of Sobukand is at peace. 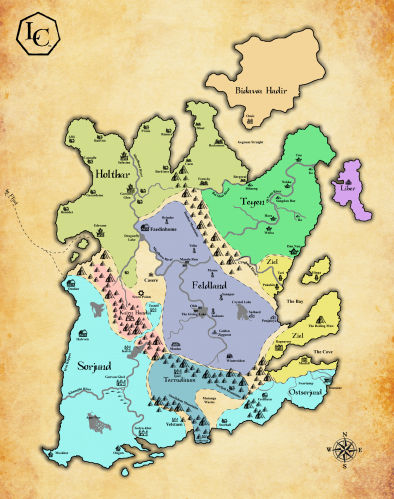 Around seventy years ago, the Kings Wars, primarily between the Kingdom of Holthar and the Kingdom of Sorjund, came to an end. The Kings of each country had died a few months apart from each other of natural causes. A truce was called to allow each kingdom to mourn. Out of this truce came a meeting, brokered by the daughters who had ascended to rule. The meeting turned into a wedding and the two Kingdoms were united into an Empire, ruled by the two Empresses. Empress Landra Cadmar and Empress Helene Lovantra then set about to gather, through treaties, the remaining kingdoms into the family of the empire and in October of 1551 the last treaty was signed and all of Sobukand was finally at peace. But what does one do when there are folk so used to fighting and there is nobody left to fight? You turn that energy and industry into exploration. So began the age of exploration and discovery for the people of the Empire of Sobukand. Many expeditions were sent out and distant land was discovered. This new land was dubbed Torakand and the Empresses decided they wished to establish colonies there. At least two major attempts at this failed. But, finally, around ten years ago the Colony of Flint was founded. This is the story of that Colony. But the people who are telling that story are all from Sobukand and so, in a way, it is also the story of Sobukand. We hope you enjoy it. This map shows the Settlement of Flint and the known area of the land of Torakand around it along with several of the larger homesteads.